This PDF 1.7 document has been generated by Microsoft® Word 2013 / www.ilovepdf.com, and has been sent on pdf-archive.com on 05/01/2017 at 12:30, from IP address 125.99.x.x. The current document download page has been viewed 163 times. File size: 387 KB (3 pages). Everything You Need To Know About Media. 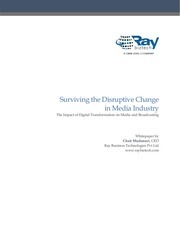 In this whole write up you will get to know more about mass media industry. technologically they are becoming more literate and adapting to the new trends. channels such as social media. new trends with their startup mindset. become a powerful tool for the media industry. different sector and put them together to have more quality work. This file has been shared by a user of PDF Archive. Document ID: 00532029.